The EU Aviation Safety Agency has formally opined that drone hobbyists should be banned from carrying out beyond visual-line-of-sight flights. If the opinion is adopted, virtually all medium-sized hobby and prosumer drones will be caught by the new EU rules, effectively turning their pilots into criminals – unless they register their craft with regulators and pass mandatory tests. EASA has proposed its regulatory framework for drones to the EU Commission. That recommendation, known as EASA Opinion 01/18, could make its way into EU law by the Commission later this year. The drone regulations will apply to the UK and are expected to be incorporated in the British government’s upcoming Drone Bill this spring. Though the UK will have formally left the EU after March 2019, which is likely to be around the same time that the Bill will come into force, in reality the EU controls aviation rules in this country – and, if the chief exec of the Civil Aviation Authority gets his way (speech transcript, 3 pages, PDF), this will continue to be the situation after Brexit. Key to the new EASA drone framework is the breaking down of drone flights into three categories: open, specific, and certified. The open category is the one which will catch casual drone fliers, while the specific section is the one that will capture the professional drone industry, such as aerial surveyors. People in Britain who make a living from flying drones, in whatever capacity, are already subject to licensing by the Civil Aviation Authority. A third category, for certified drones, will cover large craft (manned aircraft-sized) of the sort operated by aerospace companies, or perhaps, in the future, air taxi or cargo firms. The planned rules for certified drones are, conceptually, of the same level of complexity as those for real aeroplanes regulated by EASA. “Model aircraft are within the scope of this Opinion,” states the document itself. Model aircraft fliers, who confine their flights of remote-controlled aeroplanes to areas such as former airfields, will be dismayed by this statement. However, the EU has thrown them a bone, permitting national aviation regulators to issue exemptions to model aircraft clubs or particular locations. The open category covers drones of a mass between 250 grams and 25kg. Their maximum permitted operating height is given by EASA as 120m, or 394ft (in aviation, height is different from altitude: one is the distance above the ground, the other is the distance above sea level). It is also sub-divided into three categories, numbered A1-A3. These relate to flying drones of increasing size over crowds of people, as this table we extracted from the full thing explains. Operators of drones with a mass of more than 250g will have to pass various competency tests and register with the State – something the British government has already announced will take place in the UK. It is not clear whether Britain has been influencing the EU to produce this harmony of regulation, or whether the push comes from the EU. The principle behind specific, or specified, drone flights is that the operator must “declare” them in advance to a regulator. 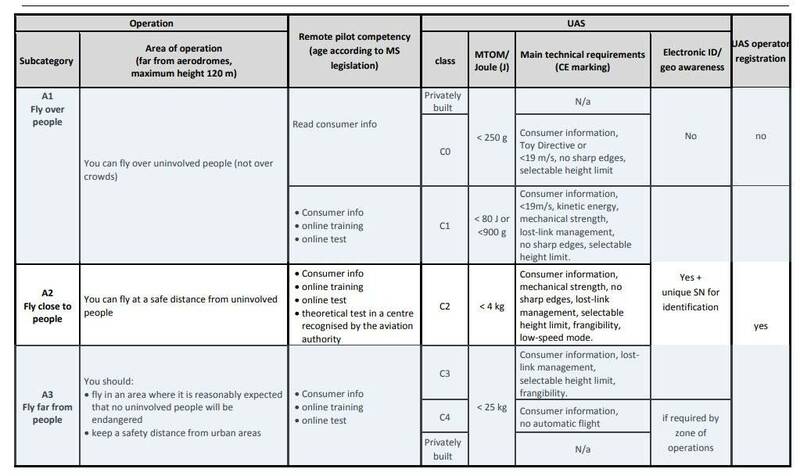 In EASA’s summary of the specific category, within the Opinion, it says that operators will be required to “perform a risk assessment and to propose mitigation measures that the competent authority will analyse and approve through an authorisation” if the flight falls outside one of the EU’s pre-considered scenarios. Beyond-visual line of sight (BVLOS) flights will only be permitted within the specific category, meaning hobbyists who like to zoom around the countryside (or even round the corner of the house) will be banned from doing so unless they go through a regulatory process designed for commercial operators. That drone crash problem: registration for all! Of great concern to prosumer drone operators will be the EU requirement for craft which are “able to transfer ‘80 J’ of terminal kinetic energy in an impact with a person” to be registered, other criteria notwithstanding. This is further defined as meaning the terminal velocity of the drone when falling from a height of 396ft (120m). Some GCSE-level arithmetic (KE = ½MV2) tells us that if we plug in an entirely notional speed of 18 m/s (about 65kmph or 40mph) for a 1.2kg drone, we get a kinetic energy of 194 joules. Leaving the speed figure the same, it is necessary to reduce the weight to 493 grams before reaching the 80J KE threshold. For comparison, a DJI Phantom drone, typical of most prosumer users’ drones, weighs 1.28kg, and its top speed is generally accepted to be in excess of 40mph. As regular readers know, the British government has been announcing for a while that owners of all drones with a mass greater than 250g will have to register them with the government and/or pass safety tests to legally fly them. The kinetic energy requirement will have to be transposed into UK law, which in turn could imply restrictions on the types of drones that can legally be sold. El Reg predicts that any BVLOS ban will be effectively ignored until it becomes convenient to enforce it against particular people, or categories of people – which is the foundation of a bad law.